Supernatural returns to Nick’s quest for revenge and picks up the thread on the only option that stops Michael from destroying the world. This show has previously suffered problems when it comes to characters keeping secrets from one another. It’s something that it leaned on too heavily in the past and there are always concerns when one character learns something that they would have previously kept secret. I’m glad to say that this episode deals with that very well and turns the previous secrecy into a character trait as it’s basically Dean’s go to position on information he doesn’t know how to deal with. Immediately his actions in this episode come across as a farewell tour. He decides to go for a drive, spend time with his mother and basically prepare for his exit from the world by spending time with everyone left that he cares about. It’s a natural reaction and somewhat mirrors Jack’s desire when it looked like he might not make it. The scenes he shares with Mary and Donna are really charming stuff that make great use of the relationships that have developed between these characters over a period of time. 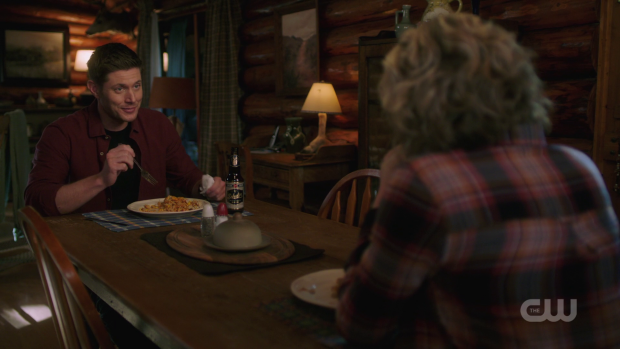 Dean’s conversation with Mary about making his own version of her famous Winchester Surprise were a definite highlight as it makes for a strong bonding scene between the two characters. Reminiscing about the time it was just John, Dean and Sam is something that the show has done very little with since Mary’s return so it’s great to see. On a basic level it’s a mother catching up with everything she missed and Dean remembering his happiest memories when he doesn’t think he has a lot of time left. What he fails to consider is how suspicious his behaviour is to those who know him well enough. 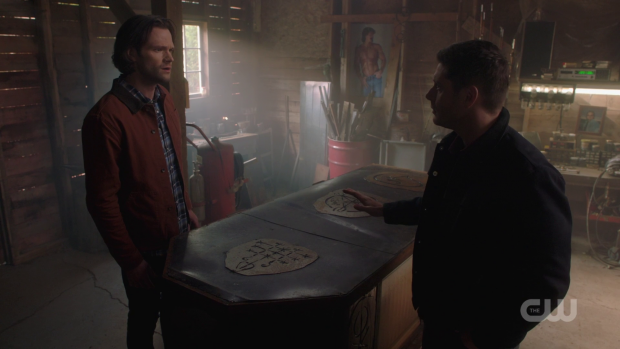 Dean is far from sentimental so his desire to pay a visit to Mary for no particular reason is noticeably out of character and raises a few red flags for him. Not to mention the hug that is only reserved for the end of the world. Sam is understandably concerned about this and forewarns Mary about what to expect but she’s prepared to take care of him and get to the truth of the matter. Once again this is an example of characters who know each other really well using that knowledge to help with an obvious problem that is going unaddressed. It’s strong work and makes for great viewing. Eventually Dean is forced to come clean about his plans and it turns out he’s building a magic box capable of keeping an Archangel captive. His plan is to lock himself in and then pay someone to drop him in the ocean so that he will never be found. Basically he’s making the ultimate sacrifice to protect the world and won’t let anyone stand in his way. Mary sees what he’s building and gives him an ultimatum to either tell Sam himself or she’ll do it for him. This leads to a great conversation between Sam and Dean where Sam calls him out on his persistent need to make unilateral decisions that affect others but Dean’s justification for his actions are that he didn’t want anyone to talk him out of it and Sam reasonably could have. Analysing this from Dean’s point of view it’s easy to understand why Dean feels that he has no other choice. He can feel Michael constantly fighting to escape and knows that his resolve is weakening so sees Michael’s escape as an inevitability. This means that he fully accepts Billie’s assertion that Michael will eventually take over him and destroy the world. To combat this Billie teaches him how build the box and Dean sets himself up to make sure that the Michael problem will be solved at his expense. As good as this character beat is it’s countered to some degree by the fact that Dean obviously won’t exit the show by exiling himself to the bottom of the ocean. The stakes feel somewhat empty as it’s clear that a third alternative will be found that doesn’t involve Michael destroying the world or Dean sacrificing himself. It doesn’t take away from the well written and acted brotherly conversation but it is always in the back of my mind when the show goes down a path like this. Self sacrifice is badly overused on this show to the point that it has lost nearly all meaning. I just hope that the solution won’t feel like a cop out. What will be do next? Nick’s return makes for some strong storytelling but also shows that there isn’t much left to tell of his story. Having him absent for the past few episodes proves to be a really good idea as there is a real risk of his story becoming repetitive. His plot takes a massive step forward here as he nears his goal of finding the Demon responsible for the death of his family. He learns that Mary tangled with him and she tells him that she trapped him in an Enochian Puzzle Box so he is still alive to be confronted. This is clearly something Nick feels that he needs to do for his own sense of closure. I really liked Nick and Mary’s back and forth in this episode. Mary clearly understands how dangerous he is but still waits for her opening despite having her hands tied. There’s a constant game of one-upmanship going on between them and the fact that Mary sees him as being a serious threat increases the stakes for her personally. As expected Mark Pellegrino is note perfect in this role. He comes across as quietly unhinged with the potential to fly off the handle at any given moment. This performance helps make his behaviour unpredictable adding yet more tension to his scenes. I’ll be interested to see what the plans are for him now that he has closure as it’s clear that his newfound love of killing won’t be easily silenced. It has been established that Lucifer will be making a comeback at some point and I’m hopeful that Nick won’t be completely replaced by him as he is an interesting character in need of a new plot. Nick’s confrontation with Abraxas (Nelson Leis) sets up the next stage of his arc. It was always going to be the case that learning why his family were killed wouldn’t be satisfying for him. His quest for closure ends up making him feel empty because Abraxas makes a point of telling him that the choice was entirely random and had nothing to do with him personally. Lucifer simply put things in motion and he was unlucky enough to be chosen at random. At least when Lucifer inhabited him he was connected to something much larger than himself but the revelation that there was nothing remarkable about him will be tough to accept. It’s likely that the loss of significance will only further his nihilism and I look forward to seeing that. Sam and Dean’s conversation about Nick was also really compelling as it helps highlight the differences between them in how they see the world. Dean basically uses this as an opportunity to basically say “I told you so!” which results in Sam giving him a lecture about compassion and believing that people do deserve a second chance. He also points out that if one thing was changed then Sam would be in the exact same situation Nick is as he was Lucifer’s ideal vessel. This allows him to understand what Nick is going through and want to give him a chance to reclaim what he can of his lost life. The most interesting thing about this is that Sam sees a side of Nick that forces him to conclude that he’s beyond redemption. Nick does point out that Sam might have done the same thing if he wanted revenge but Sam isn’t prepared to listen to him and tells Nick that he’s beyond redemption. It takes a lot for Sam to give up on someone so the fact that he sees Nick as beyond help is really powerful. This will only contribute to Nick’s nihilism because he can be sure that everyone has given up on him. A strong episode that delivers really powerful character moments and makes great use of established relationships. Dean’s farewell tour is recognised as being out of character to the point that it is noticed by others. Sam and Mary’s reaction to his behaviour works because of how well developed the relationships are and leads to some really strong character moments such as Dean talking about Winchester Surprise with Mary. He also justifies his behaviour to Sam by telling him that he sees no alternative and didn’t want Sam to talk him out of it. 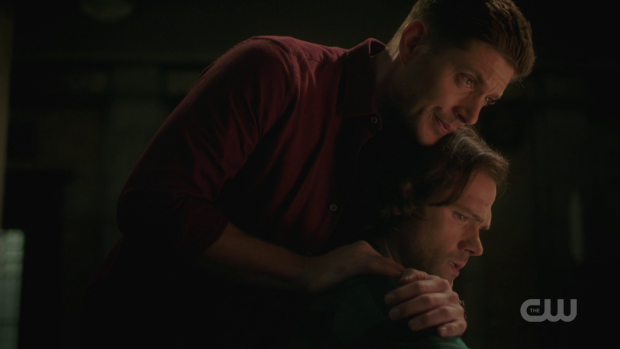 The self sacrifice plot is feeling a little tired and it’s clear that Dean won’t leave the show by exiling himself to the bottom of the ocean so the stakes never quite feel strong enough. Nick’s return brings the resolution of his quest for revenge. 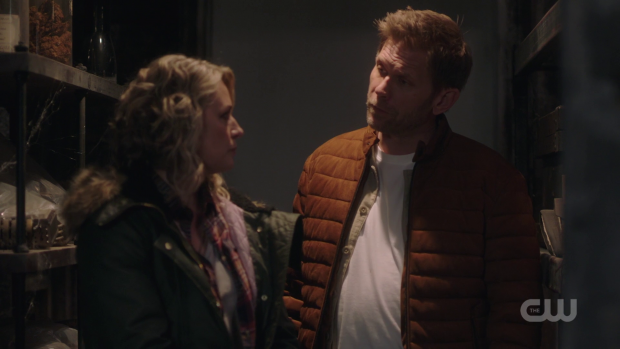 The constant game of one-upmanship between him and Mary works really well and Mark Pellegrino’s performance helps to make Nick’s behaviour dangerously unpredictable. The growing sense of nihilism within Nick enhanced by learning that there was no deliberate reason for his family being killed and Sam giving up on believing that he could ever redeem himself sets up interesting directions for his character to go. Hopefully the upcoming return of Lucifer won’t remove Nick entirely.